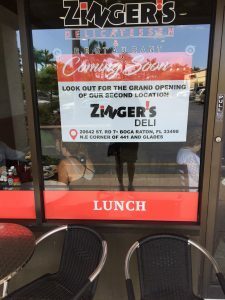 * Zinger’s Deli, 20642 State Road 7, Boca Raton, Florida. Just between you guys and Jeff Eats, I kinda think that Zinger’s Delicatessen is one of the best- if not the best- Florida- New York Kosher Style Deli that I’ve eaten in over the past 25 years. With all of the above in mind, I’m going to keep a close eye on this coming store #2 “development” and as I get information I’ll pass it on-to you guys! Zinger’s is a top notch deli. There is absolutely no doubt in my mind that Zinger’s is the best NY Kosher Style Deli in s Florida. I can’t wait to see what #2 is all about. I know the spot and it should be a hit from Day One. I congratulate Zinger’s! Definitely one of the best deli’s in Florida! Zinger’s pastrami on rye, ff and cream soda. If you haven’t tried it, get there. I’m really forward to seeing new location.